Well, even though the month of February is passed already, creating a romantic event for your loved one can be a fun thing to do. If you want to celebrate a special day or planning a beautiful event for two on a very special occasion, of course, you want it to be the best thing possible by doing thoughtful planning. In Indonesia, the places are not limited by Bali Island only. There are many possible places that you can use as a romantic place, like Raja Ampat Islands for example. When planning an event in that island, you need to know some things first in order to make your plan goes smoothly. And this is the tips to make romantic event in Raja Ampat Islands for you. The first and most important thing to do in tips to make romantic event in Raja Ampat Islands is to decide where you want to stay in Raja Ampat. Thankfully, the location has a large varieties of resort and hotel, so you can pick one based on your budget and likeness. You also need to think the need of your partner and level of privacy for you two to have a nice time to rest in a comfortable place. You can pick the one that most affordable that usually below 4 stars, like homestay with a small house that usually filled up by some people. It’s less private but with the less price also. If a budget is not an issue, you can go to five star hotel with private room and private pool. When you want to visit someplace new, far away from your hometown, you really need to plan your budget. You don’t want to go out of budget while on a vacation. It’s a really bad thing to have. So, before you actually go to somewhere, make sure to at least prepare a decent amount of money for your holiday. Just do a little listing about the costs for transportation, daily expenses, and also the entrance fee for each attraction you want to visit with your loved one. Other than that, it’s completely optional, but not less important nonetheless. Even though people only know about the name of Raja Ampat, but sometimes they can get confuse when deciding where to go. You can see some references about the unique and beautiful places you can go in Raja Ampat Papua, like WTC beach, Painemo island, or even the Timbul Beach of Raja Ampat. Also, remember that you’re doing a romantic vacation here with your lover, so make sure that the attractions don’t slow you down and make your holiday more frustrating or depressing. Try to visit the calm places for a couple like beaches, lagoon, and also bar. This is needed when you’re going to Indonesia from your hometown located outside the country. Even if you’re in neighbor countries like Malaysia, Philipine, or Australia, of course the visa is always needed. 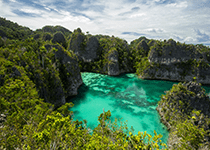 There are two visas that you can choose if you want to visit Raja Ampat and they really depend on the days you’ll spend. If you want to have a vacation for less than a month (a couple of weeks maybe), then maybe the 30 days visa is the most suitable one for you. Other than that is the 60 days visa for long stay in Indonesia, mostly used for business purposes. Always go somewhere far only if you’re healthy enough for it. Never push your limit to far, or you’ll be laying on a bed in a hospital somewhere and just miss your days of vacation just like that. Before going to Raja Ampat, make sure that you’re healthy and ready to explore the whole new location. Both you and your loved one should be always healthy no matter what. Eat healthy and get the medical checkup if needed. Also make sure to bring the medicines with you, they can be a great help in desperate situation. After planning the budget, picking the locations, and done many things we mentioned above, then maybe it’s time to look at some reviews about Raja Ampat so you can have this imagery about what kind of place you’re into. You can see some of them in the famous sites and see the individual thoughts about Raja Ampat. When seeing the reviews like this, you can understand many things like knowing what activities that can be done in Raja Ampat, things to avoid, best locations to visit, many useful traveling tips and many more. Next thing in tips to make romantic event in Raja Ampat Islands is to travel to Papua. Finally it’s time to go. After packing your stuff and done booking a ticket, it’s time to go for Raja Ampat after all these preparations. You’ll need to take a plane to Sorong first, then continue your journey by either using a ferry or a boat to go to Raja Ampat in Papua. But you need to be careful because sometimes it can get pricey, especially for the boat. Also, one thing to remember is always to add up your rupiahs. Raja Ampat is a very far place, and sometimes you can’t even find ATMs when you need them the most. That’s why when you’re in Sorong, make sure to have enough rupiahs for vacationing in Raja Ampat. Now, the time to finally visit those wonderful places is coming. From this point onwards, we want to desribe some of the best places around Raja Ampat that you might visit, let’s start with the first place in tips to make romantic event in Raja Ampat Islands called Piaynemo Island. If you have the Rp100.000,- currency with you, you can see the picture of Piaynemo Island right in the background. It’s like visiting Raja Ampat is not complete without seeing the Piaynemo Island. You can see its true beauty high on a viewing platform up the hill. You need to take about 200 or more steps though, it will be a little long way to go. Moving from there, we’re going to a lagoon, a special and romantic place for two called Telaga Bintang or the Star Lagoon. You can easily reach this place by using a boat right from Piaynemo Island. It’s only five little minutes from there. Just like Piaynemo, you need to go to higher ground to be able to capture the beauty of Star Lagoon. Just like its name, the laggon has a star-like shape. And it’s very confincing actually, remembering that it was made naturally by the mother nature and nothing else beside that. It’ll be very much worth it to visit this location. Aside from the Piaynemo islands, there is one location, a lonely island called Wayag Island. Even though it seems to be very quiet in here, but its beauty can take you to another world. The magical world of Raja Ampat. Wayag Island is one of the icons of Raja Ampat that can be seen clearly during the morning. To see the true face of Wayag Island, the way is not that easy. You need to reach for the highest point around it, which is a hill called Pindito. It’s a bit hard way to go there, especially because it’s really steep. Next one in tips to make romantic event in Raja Ampat Islands is to visit Arborek. Aside from seeing the natural beauty from those interesting attractions, you and your partner can have a good time interacting with the locals at Arborek Village. A small and humble village that filled with kind and friendly locals that can make everyone puts a smile on their face. Their simplicity of live, up to their culture are always interesting. Sometimes, when certain group of guest coming to their village, they do this kind of special dance to welcome them. It’s really heartwarming if the same thing goes to you. The definition of the dream island can be found in here. Imagine a beach located not right in the middle of the ocean. That’s certainly possible thing, and you can find it right in Raja Ampat. The name is Pasir Timbul Island, a little area of sand that joining together with the blue of the ocean. Even though the tides are always coming every single day, the sand is not decreasing through years, even a bit. Many tourists are always interested to see it, including the couples who want to take their nice pictures with the hashtag of beautiful Raja Ampat. Sometimes, it can be a romantic place, especially when you can actually walk on the sand and have fun with your loved one. Surprisingly, Raja Ampat is not a place for diving, swimming, and the usual activities you can expect from a tropical island. But, you can also find a gift for our ancestors in the form of cave paintings done by the ancient locals many times ago. 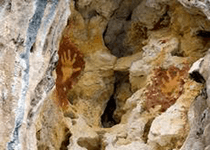 They made hand paintings on the cave wall using a special paint. That’s why you can see many hands there, and thankfully they are as clear as a day. It’s like all of them were painted yesterday. Aside from Pef Island, you can also find the other ones in two other locations, Sumalelen and Sumbayo. Well, what else is romantic beside a candle light dinner and comfortable cuddling session? Diving! Even thoguh swimming is not for everybody, but it’s very easy to learn and you can have fun learning them. Around Raja Ampat, you can also find some reputable and dependable diving courses with the good instructors also. 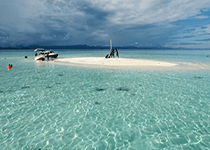 Raja Ampat is perfect with its diving locations. And most of them are still beautiful even today. That’s why so many people always recommend this place as the best one for diving. There’s only you, your partner, and the ocean. Enjoy your dive.